An Introduction to Clear Quartz Crystals. The absolute essential, Most all-purpose crystal of all time. Any other kinds of crystal must be identified by name. When someone just says crystal, quartz is the crystal they mean. This is the real deal, not cut glass imitations (though those are part of fung shui, Energy medicine and some color healing work.) One quartz crystal is not enough. Though one may often be plenty. Individual quartz points with a single termination/point are the most worked with. Each crystal whether a single point or a cluster is an individual with its own story and mission. One crystal may move through the hands of many people and share information and energy with each and for each have a completely unique sharing. One single crystal may give one person an instant of joy, of discovery one person the promise of abundance, another a vision that may explain to that person their own history in terms of eternity then pass to a child to offer laughter and calm, may then be held in passing by some one who needs and receives healing , then move to another child and awaken her gift of seeing and hearing the spirits teaching one the value of gifting along the way and another of science and form, then be given to comfort the grieving at a deathbed and from from there move on to gift and bring light and healing or meditations focus to many other. All the crystal that have come out to be among us may have as many and more stories and missions and healings to share. The crystal most used in crystal healing is quartz. Sometimes called frozen light, quartz crystals form of silicon dioxide under heat and pressure. Quartz has both piezoelectric and pyroelectric properties which means that the polarity of quartz crystal will change when subject to pressure or heat as well as when held. Piezoelectricity is that quality by which electricity and sometimes light is produced by compression. Many cultures and spiritual traditions have used crystals in ritual, often striking them to produce flashes of visible light. Pyroelectricity is that quality of an electrified state or polarity which is produced by variation in temperature. To scientists, engineers and communication specialists quartz crystal is a key component in radio, radar, sonar, television, watches, and computers. Quartz can transmit and receive, amplify, focus, project and store energies. They are the most versatile of stones. They are used in healing, in meditation, in manifestation, for protection and communication on all levels. They can work on every level for spiritual, physical, emotional mental healing. Clear quartz crystal or rock crystal is found all over the world and is among the most common minerals on Earth. The natural crystal formation is six sided or faced. Quartz can be used for any crystal purpose and can substitute for other crystals. Single and double terminated and tumbled quartz are probably the most used forms for crystal work. Clusters are also used a lot. Clusters are two or more crystals joined together in some way as bunches of crystals. There are many different variations in the growth and faces of quartz crystals and many specific variants are used in specialized ways. 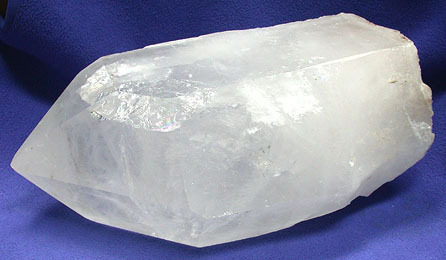 Single terminated crystals have one six sided point on one end and primarily direct energy in one direction. In most healing techniques the point of the crystal is pointed toward where you want to send energy. To increase energy in an area you point the tip of the crystal in to the center of your treatment area. To remove energy or for cleansing you may point the crystal away from the center. There are other traditions where the point is used for both projection and reception of energies. Single point crystals are used to charge chakras, disperse negative energy and for work of many kinds. Virtually all crystal work can be done with single termination crystals. Most people who work a lot with crystals will want to have a number of these in various sizes. Single point crystals are often worn as jewelry or carried as personal stones. Double terminated crystals have a point on each end. They are multi-functional, energy moves outward in either direction or in both directions simultaneously. These natural crystals may have grown in soft clay or as part of a cluster. The naturally formed doubly terminated crystals are usually considered to be more effective than crystals which have been carved into a double terminated form. The carved double terminated crystals are often used as healing wands and for massage. Double termination crystals are used to open a line or channel of energy between two chakras or points and to exchange energy or enhance communication between two people or organizations. They are often used in dream work, astral travel, journeying and to enhance meditation and visualization. They are also used for protection and help to maintain energy shields and filters. They are also sometimes used as tools for moving, removing and transforming energies from one location or condition to another . Clusters are groups of crystals. The termination's may go in many directions. Often they emerge from a joint matrix or base. The crystals reflect light and energy back and forth to each other. They have a strong cleansing and healing vibration. They can be used to clear energy in rooms and to assist family and group activities. They are often used as a focus or symbol for group healing and meditations. They can help harmonize the individuals in a group. They can be used to facilitate organization of multifaceted activities such as studies, writing or business plans. Other stones and crystals can be cleared by resting on a cluster and clusters have been used to activate and enhance the energy of other crystals. Much crystal is milky white at the base and gradually gets clearer toward the tip. Some crystal is as clear as water or cut glass. Other crystals are milky white and opaque. The clear crystals are often classified as Yang or Male crystals and said to represent action, power, force, strength and creativity.Milky white crystals are often classed as Yin Or Female crystal and said to represent receptivity, love, communication, negotiation and sensitivity. A crystal with both clear and milky is believed to represent a balance of the active and receptive energies. Most crystal seems to have a combination of clear and milky crystal. The Male / Female quality of the crystal is not really of particular importance for most forms of crystal work. Some people feel that the clearest crystals help with mental clarity and rational thought and that the milky crystals promote intuition and sensitivity but I have not found that the difference if any is significant for most work. Rainbow Crystals are those which have veils or fractures within them which reveal rainbows. These are very uplifting crystals which promote joy and inner peace and are often used as meditation crystals. Veils and inclusions are often present in crystals these are said to represent the ability of life to transform stress and trauma to light and beauty some of these crystals can be profoundly healing of emotional and mental pain and sorrow. Tumbled quartz which is polished to smooth out the configuration or water tumbled quartz which is naturally smoothed also has many uses often it is placed as the center stone in sections of crystal layouts or used as a meditation or seer stone. The energy is projected from the entire surface of the stone so the energy might be sensed as more diffused or gentle . Other members of the quartz family and uses for special formations of quartz, many methods of using quartz and information about colored quartz crystals is discussed in several different articles in this site. large 35 lbs clear quartz crystal! How do we program these Quartz crystals?Do we insert intention such as seeing Powerful Good energy enter the crystals or do we just say aloud "I want to be more lucky and more prosperous." What a fantastic and indepth description of this fascinating crystal. The quartz family is by far my favourite crystal type and of course of these this quartz is by far the most important! I really enjoyed reading up about it on your post, never knew that much about it before this! I just thought I would add about the property of quartz to vibrate at 32768hz ( 32768 vibrations a second). In case anyone does not know what significance of this, the quartz crystal when correct cut and mounted, and a small current applied, has a vibration of a factor extactly divisible by 2 in 15 divisions, which = 1 second. Which is how they use it to calculate time very, very accurately to about 6 parts per million. The only variable to this , is the temperature of the quartz. I use quart clear crystals as amplifiers and directional aides for pushing energy around, or pulling it in the direction of the termination. Posted: Wed Jun 23, 2010 10:12 pm Post subject: Quartz RADIO crystals???? Hello, I am just getting started with crystals and healing. I have a bag of quartz radio crystals. They are little metal rectangles with two hookup prongs coming out one end. I assume that they each have a frequency that can be used to transmit a radio signal. If the two leads were connected to the proper power source I would think you would get an occilation maybe in the CB region. I wonder if they could be used like regular quartz for healing somehow? Posted: Wed Jun 23, 2010 11:30 pm Post subject: Re: Quartz RADIO crystals???? Interestingly enough, quartz is used to produce oscillation by passing a small electric current through it.. the reason this is done is because Quartz vibrates at exactly 32768 cycles per second, which when halved repeatedly, produces a very exact 1 second, to many decimal places, which is why they are used for digital timing devices with quartz timings being very exact for time, and also exact frequencies, like radio & TV electronics.. They are just quartz crystals however. They can be used for healing, but are very small. They will also have been shaped (ground / tumbled) and lost their natural terminations, which I personal think results in these crystals being very stressed indeed, very stressed... I do some work with a healing group that build healing devices out of crystals and metal, but these are usually a lot bigger than the minutia devices you have in your possession (unless they are really old ones, and big?). Personally, I would just aim for other raw crystals with terminations on them. Quartz I use to amplify other crystal effects, and direct energy through the terminations themselves, which quartz is very good at. I find quartz best used in this fashion.. its amazing stuff..
OK, thanks. I think maybe I will throw them all into a HHG all mixed together. Quartzsite this winter is where I will pick up crystals. Do you work with Orgone ?